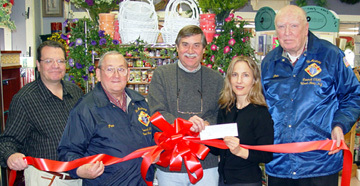 $10 buys a ribbon on The Boulevard, and provides holiday dinner for a family of four. I have always thought of Christmas time, when it has come around apart from the veneration due to its sacred name and origin, if anything belonging to it can be apart from that -- as a good time; a kind, forgiving, charitable, pleasant time; the only time I know of the long calendar of the year, when men and women seem by one consent to open their shut-up hearts freely, and to think of people . . . as if they were fellow-passengers. . . .
Business! Mankind was my business. The common welfare was my business; charity, mercy, forbearance, and benevolence, were all my business. The dealings of my trade were but a drop of water in the comprehensive ocean of my business! 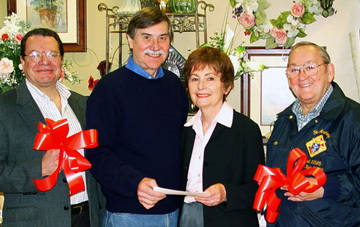 Area residents had an unprecedented opportunity to meet each other, make new friends and renew acquaintances on Wednesday, September 4th, 2002, when Bill O'Shea's Florist hosted the 7th Annual Good Neighbor Day. Good Neighbor Day began 8 a.m. at Bill O'Shea's Florist, 109 Boulevard (at the Circle), where a 12,000 roses were given away absolutely free to anyone who visited. No purchase was necessary. Before receiving FREE Roses, the residents were invited to make a food donation for the Center For Food Action (CFA), the non-profit food bank that has served our area's needy since 1976. CFA welcomed basic non-perishable food items such as juice, cereal, canned goods, pasta, baby food, etc. This year 326 bags of food helped restock the pantry, and $366 in cash contributions were received. Bergen County Executive Pat Shuber stopped by to make a food donation, and also to present both Assemblywoman Heck and Bill O'Shea with "Certificate's of Commendation" for their efforts. Jukebox Radio's (103.1FM) DJ added to the festivities, and also taped interviews for later broadcast. Free Roses ... Bring Food! On Wednesday 8 a.m., September 5, 2001, Good Neighbor Day began at Bill O'Shea's Florist, 109 Boulevard (at the Circle), where a 1,000 dozen roses (that's 12,000 roses) were given away absolutely free to anyone who visited. No purchase was necessary, but food contributions were welcome. Bill O'Shea reminded us, "The only stipulation is that those picking up the roses were asked to keep one for themselves and to give the other 11 roses away to 11 different people and in so doing, help create a friendlier, more caring and compassionate community. Good Neighbor Day is a day designated for people to meet and get to know their neighbors. A rose is the perfect expression of friendship and love." This year, Good Neighbor Day generated about 300 bags of food and about $400 in cash contributions. The Center for Food Action always welcomes basic non-perishable food items such as juice, cereal, canned goods, pasta, baby food, etc. Food items should not be open, expired or in glass jars. A $10 contribution buys a bright red ribbon with the contirbutors name on it and placed along the Boulevard begining Thanksgiving until Valentine's Day. © 1998, 1999, 2000, 2001, 2002, 2003, 2004, 2005, 2006 All rights reserved. Site developed by Fritz Rethage, Iron Horse Advertising & Marketing Co. Inc.